the following morning! Our team of ladies at the bar are here to make your stay enjoyable. In our restaurant you can choose from a varity of Belgium diches or local Thai food . *Special Belgium blond/dark beers available. We have 10 nice rooms for rent (restyled dec 2011 ! ) available to make your stay with us, a comfortable one. Each room has air conditioning, TV, fridge, safety box and a bathroom with shower. 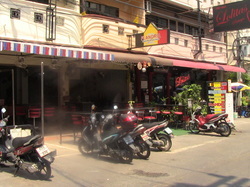 Rooms start at just 500 Baht a night! Come on by and check it out yourself !